In just two short weeks, my little girl will turn two. I realised this morning (with a touch of horror) that I have four different events to bake for. Her actual birthday, cake to take to nursery for her last day in the baby room, cake for when my two neighbours pop round with their children for coffee and a cake for when the 'rents visit the weekend after her birthday. For her actual birthday, it's just me and her and the husband. The husband isn't really allowed cake, what with his diabetes, but in my world, birthdays should always be celebrated with cake. And so I wanted to make something quite small that we can easily share and not have too many leftovers (although I'm sure my work colleagues would have done the honours on the remains). Googling about for inspiration for her main cake, I happened across some adorable Sausage Dog cupcakes. My cousin, the lovely @BridestockBride and Miss A are both doxie obsessives. If you're a regular follower, you'll know that we have a doxie called Rolo and she's Miss A's best mate. We also regularly make 'Rolo' shaped cookies and I've been spreading the doxie cookie cutter love amongst my Twitter friends - discovering the lovely @LaurenPrince (go and visit her blog when you're done here!) is also a fan. If you want to know where to get your own doxie cutter from, then visit Cakes, Cookies and Craft Shop. Anyway, the cupcake doxie appears to be just a line of ganache-topped cupcakes with biscuit ears and faces. I'm going to use Dame Mary's cupcake recipe from 100 Cakes and Bakes (and the subject of last week's Weekly Bake Off challenge) and try out the Primrose Bakery Bourbon Biscuit recipe which was recommended to me by the lovely @HungrySquirrels (another fab blog to read) - because they are dachshund shaped! With antennae made from rice noodles! For the visit from the neighbours and their assorted toddlers, I'm going with further cupcakeage. 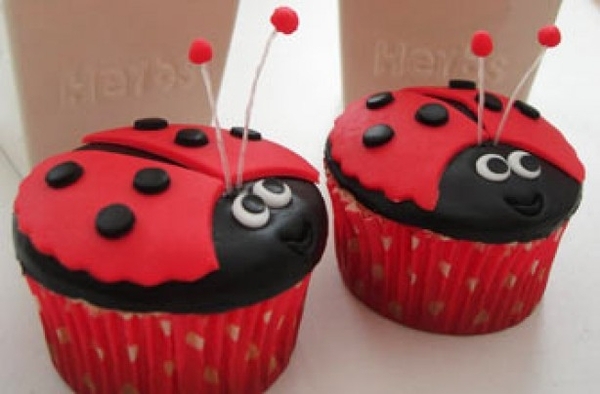 I still can't decide which to make although ladybirds are currently at the forefront of my mind. I joined Pinterest today. If you're not au fait with this, it's an online mood board website where you can post pictures of things that you like. I love it as I often happen across pictures of things I'd love to have a go at baking and then forget where I saw the picture. You just click a button on your browser's bookmark bar and it saves the pic to your Pinterest profile for posterity. Love it. Finally, for the main event, I'm hoping to make a dalmatian themed cake. These are Miss A's second favourite dogs. My poor spaniel will be jealous - but he doesn't like her unless she has food so he can't complain too much. 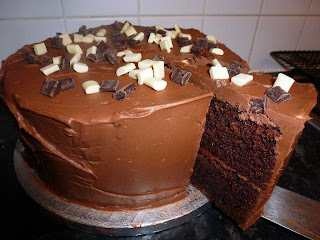 I want to make a fondant covered chocolate cake and, despite being a huge fan of Angela Nielsen's Ultimate Chocolate Cake, I felt the time was ripe to see if there are any other comparable (or better) recipes on the market. Given that it's for such an important occasion, I wanted to road-test it first. I asked Twitter and Twitter suggested Nigella's Guiness Cake. Sounds amazing, but not really suitable for toddlers. Flicking through my copy of Nigella Bites, I happened across her Chocolate Fudge Cake which sounds like it fits the bill. Twitter confirmed this to be so and it's currently cooling in the kitchen, waiting to be iced. So far, the experience has been worrying. The recipe states to use two eight inch (20cm) sandwich pans. I fear Ms Lawson's must be at least three inches deep as by the time I'd finished the batter, it was very evident that I would head for disaster using my little two inch deep pans. I quickly fished out my 8 inch Christmas cake tin which is five inches deep. Even this only had a gap of an inch at the top when the cake went into the oven. At twenty minutes, I was on my knees in front of the cooker, praying to the High Priestess of Baking (Dame Mary) that it wouldn't overflow and leave me scraping burnt offerings off of my grill pan which I'd sensibly put underneath. Thankfully, it rose a mere half inch out of the tin, leaving me with a cake that's even bigger than Nielsen's Ultimate Chocolate Cake. Excuse the messy edge on the cake board please! I am now off to finish off the icing. It's taking an age to cool - I guess because it was in the oven for an hour and a half vs the fifty minutes recommended for the two-pan method. And if it's a nay, then I'll be moving on to Lorraine Pascale's 'I Can't Believe You Made That Cake' next. Verdict and photos will be posted tomorrow once the work mates have got their teeth into it. Update 1st March 2012: Well my colleagues were really impressed with this one. And when someone finally was brave enough to have the first slice, it went like wildfire. I even got asked for the recipe. However, and it's a pretty big however, I'm obviously getting really fussy in my cakeage because I really didn't like it. It tasted just like a mediocre chocolate fudge cake that you'd get with squirty cream or cheap soft scoop ice cream in a chain pub. Now there's nothing wrong with that kind of cake, necessarily. But I don't aspire to bake cakes like that. The icing was bland and too buttery for me. The cake lacked a deep chocolate flavour. Someone asked if it was cherry flavoured and I must confess even I got a hint of cherry once it was pointed out to me - but no fruit was harmed in the making of this cake.